An effective intranet analytics strategy is crucial to the success of modern intranet platforms such as SharePoint Analytics, Plone, Confluence Analytics, Liferay and ThoughtFarmer. Implemented effectively, it can provide actionable insights into employee behaviour. You can use this data to boost employee productivity, to ensure that content is compelling and relevant and to empower employees who deserve it. The best practice is to establish a measurement strategy around critical success factors. Agree on intranet analytics data, such as the number of created new docs, page contributions, user interactions, total page views and logins, and communicate this to the workforce. Then, conduct a quarterly audit of how the intranet is being used and make data-driven decisions to boost productivity and motivate the workforce. Growing businesses tend to have sprawling intranets. As teams and departments add new sections and sub sections to their infrastructure, it can get out of hand. According to Interact, around a fifth of time is wasted by employees searching for information to do their job. Intranet analytics can help identify wasted clicks and searches. An intranet analytics audit would focus on identifying and refining failed search queries to save employee time and boost productivity. Refining 10 failed search queries, for example, equates to saving around 15 minutes of employee time. Gallup research shows that disengaged employees cost the U.S. between $450 billion to $550 billion each year in lost productivity. Companies can use analytics for intranet to identify employees using the intranet less than five times per week and subsequently take action to help them become more engaged with the culture and business to boost workforce productivity in the long term. Your employees won’t engage with your content if it isn’t compelling or relevant. Intranet analytics can be used to identify your most and least popular content. So, if you see one of your posts isn’t earning views, you could look to replace it with more interesting content, or improve its positioning. With HR departments under pressure to make more data-driven decisions about their workforce, analytics is playing an increasingly important role. Intranet analytics can help you identify evangelists, pinpoint collaboration efforts and praise go-getters – for example, teams showcasing intense sharing activity and engagement around large projects can be offered more resources. 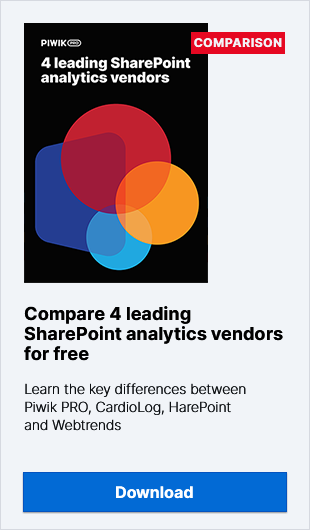 To learn more about how Piwik PRO can unlock these areas of your intranet and SharePoint service, please contact our team of Piwik PRO experts for a free consultation. When Can Intranet Analytics Jeopardize Your Legal Compliance?